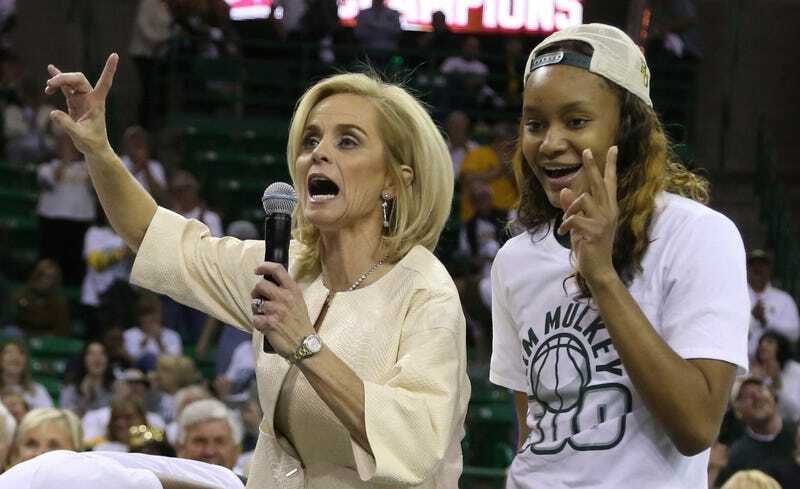 Baylor's Kim Mulkey: Knock Parents Concerned About Sexual Assault Scandal "Right In The Face"
Today was senior day for the Baylor women’s basketball team, and rather than spending her time at the mic focused solely on her soon-departing players, head coach Kim Mulkey took a different route. While the sexual assault football scandal has plagued the Baylor football program, leading to a recruit exodus and 7-6 season filled with distractions fueled by their staff, coaches, current and former players, and fans, Baylor’s basketball programs have thrived over the past calendar year. The men’s team is currently ranked No. 9 (though they’ll drop after today’s loss to unranked Iowa State) and the women’s team sits at No. 4 in the polls. "The best damn school in America"